DENVER — It was a delightful start to the week with partly cloudy skies and warm temperatures! Temperatures in Denver bounced back to the 70s, while readings reached the 50s in the mountains. Skies will remain partly cloudy tonight as some high, thin clouds drift in ahead of the next storm that will impact Colorado. Low temperatures will be mild - in the low to mid-40s in Denver and across the eastern plains, with upper 20s to mid-30s in the mountains. A cold front will move toward Colorado on Tuesday and bring a chance for showers and thunderstorms later in the day. Temperatures will still be mild ahead of the front, with highs in the 60s to low 70s for Denver and the northeast plains. Some readings will reach the 80s across southeastern Colorado. In the mountains, rain and snow showers will develop in the afternoon. The storm is not going to be a strong one, but two to four inches of snow may fall in the mountains above 10,000 feet Tuesday night and Wednesday. Temperatures will turn cooler as the front moves across Colorado on Wednesday. 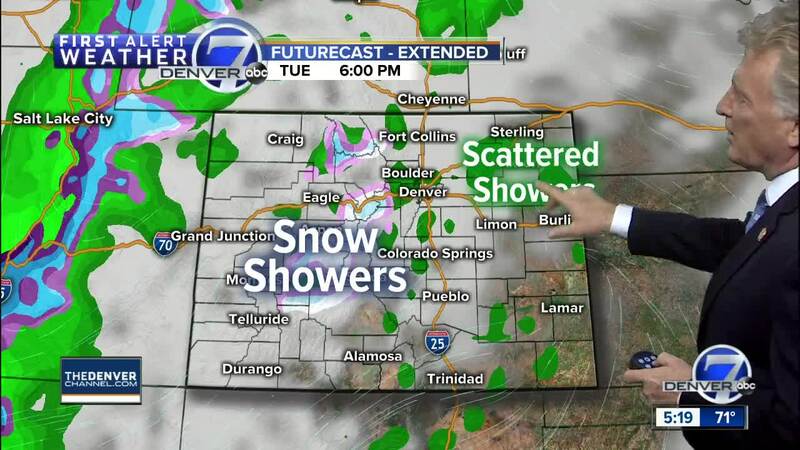 Showers will be likely in the Denver area with highs in the middle 50s. The storm system will move out of the state on Thursday. It will still be cool and rather windy, but skies should begin to clear in the afternoon. Highs will stay in the 50s in Denver and in the 30s in the mountains. Warmer and drier weather will cover Colorado on Friday with highs climbing back to around 70 degrees in Denver. Saturday will also be warm with highs in the low to mid-70s. A new storm system will bring a chance for rain to Denver by late Saturday and on Easter Sunday, with snow for the mountains. Temperatures will be cooler again on Sunday with highs in the 50s for Denver and the Eastern Plains.